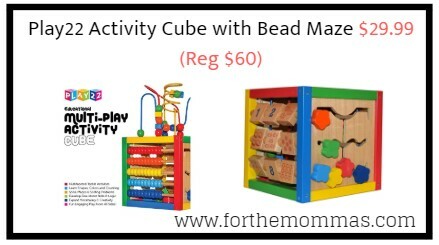 Amazon has Play22 Activity Cube with Bead Maze $29.99 (Reg $60) with FREE Shipping. This activity cube toy improve and cultivate kids’ hand-eye coordination, logical thinking, imagination and creativity, fine motor skills, color recognition, shape recognition. Each side has a different activity. Wooden Activity Cube Includes 5 Activity to play which is Baby Blocks Shape Sorter Toy with 4 Color Shapes, Abacus Counting Beads, Sliding Shapes, Spinning shapes Counting Numbers and A Removable Wire Bead Maze On The Top.